Hope you have been enjoying all the Petite Prints inspiration on the blog lately. I am loving all the new floral/grid and dot/stripe petite prints, talk about a rainbow of happiness! 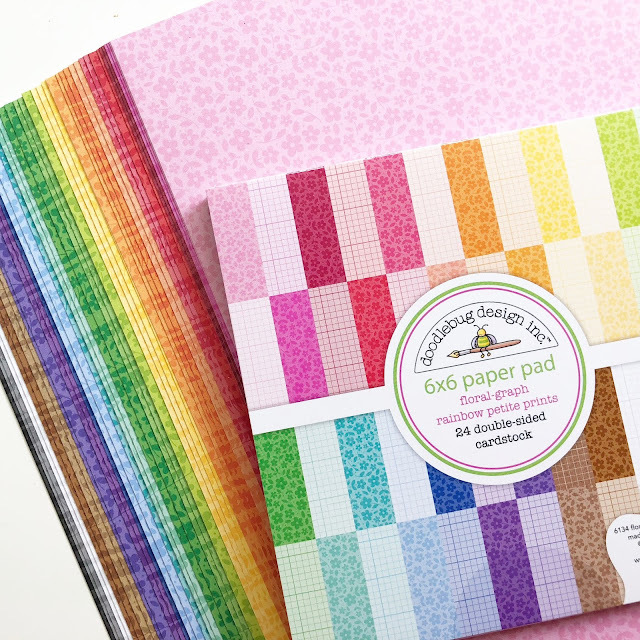 The smaller scale patterns on these papers are a wonderful way for add a colourful backdrop to your craft projects. Do you remember those one-sheet wonder templates for card makers? 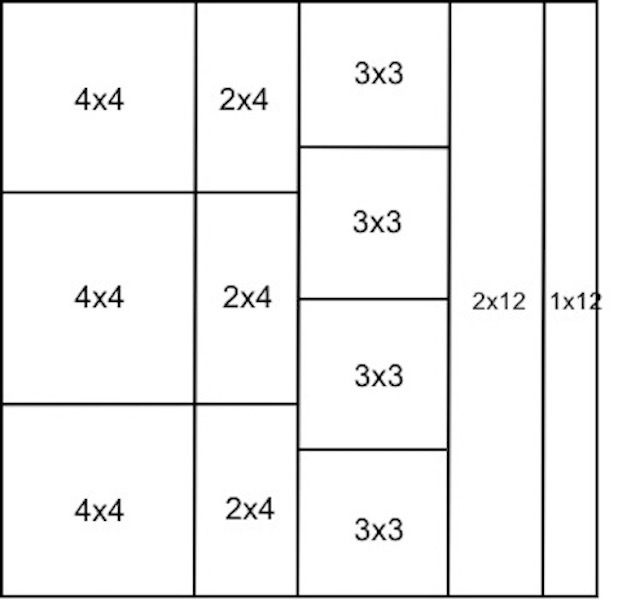 I created a very simple one-sheet cutting template and used the same cutting template for two contrasting petite print papers. I chose the yellow dot/stripe and the blue floral/grid patterns. 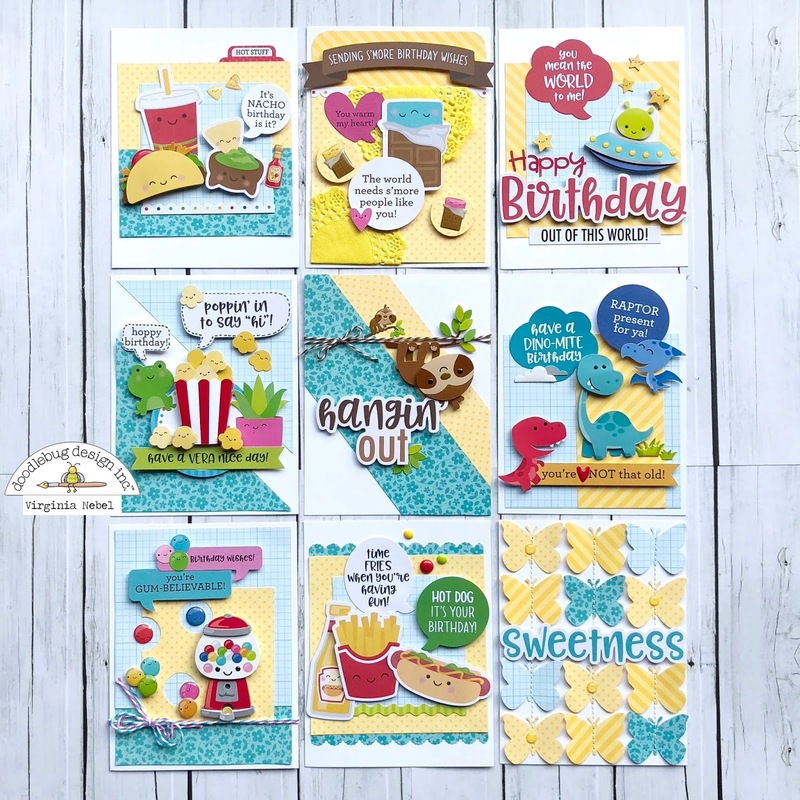 If you follow the cutting template you will create a pile of double-sides squares, rectangle and strips that can be layered to create nine A2-sized card fronts. I dipped into all the awesome So Much Pun ephemera elements to embellish my cards. 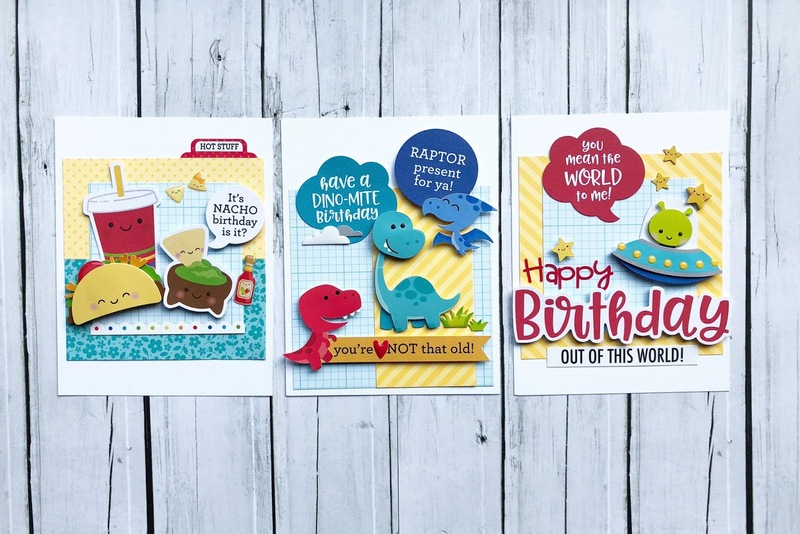 My pile of ready-made birthday cards are running low so this is a great way to restock my birthday card stash! 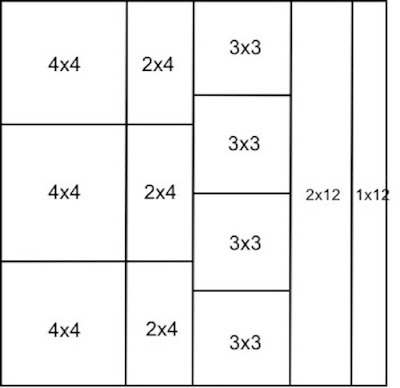 I'll quickly run through each trio of cards and indicate which pieces are used to create the backdrops. 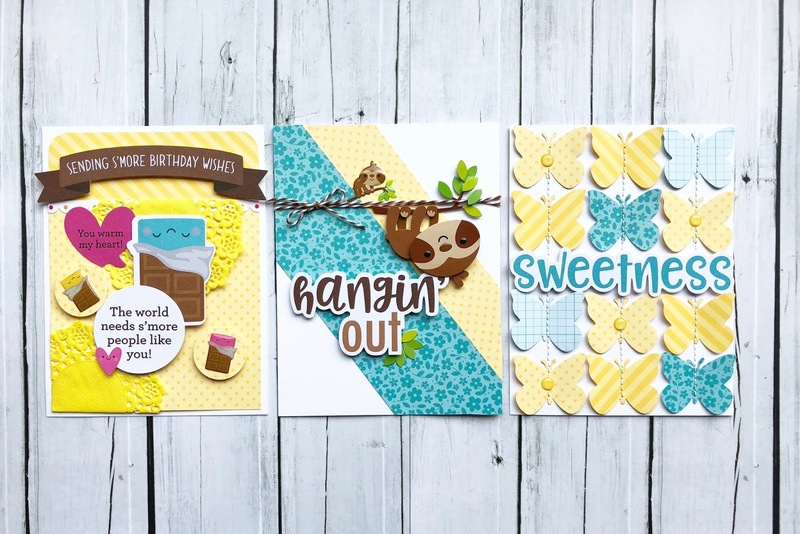 The first trio is simply taking rectangle and square pieces to create a simple pattern base. The second trio will require a few tools - a circle punch, your favourite border punch and a trimmer. Card 4- You're gum-believable!- blue 4x4, 4x2, yellow 3x3 (circle punched out). 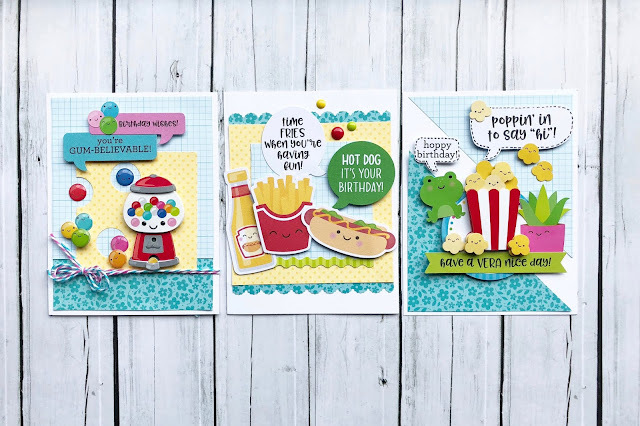 Card 6- Poppin' in to say Hi!- blue 4x4 (cut on a diagonal). 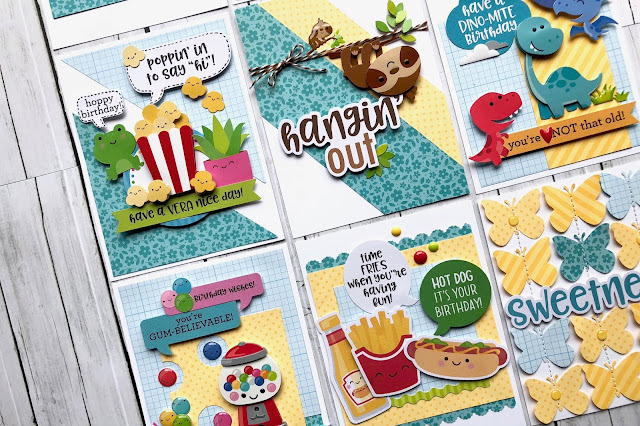 The last trio uses up the rest of the pieces, if you have a favourite die cut or punch- now is the time to use it! Card 7- yellow 2x4, 4x4, 3x3 (circles punched out to highlight shape sprinkles). 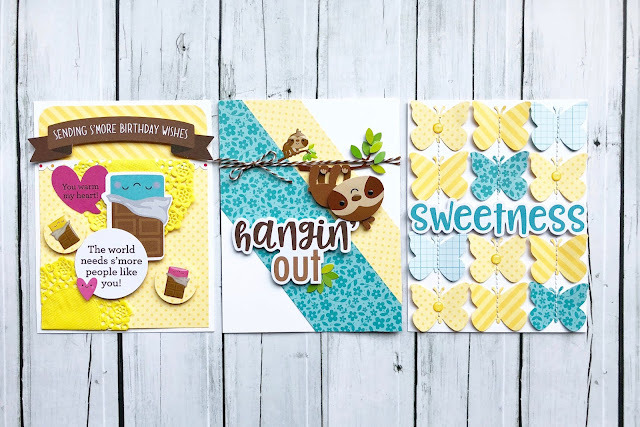 Card 8- blue 2x12, yellow 1x12 - adhere to the card base on an angle and then trim excess. Card 9- butterfly punch used on remaining pieces left over to cover the card front. 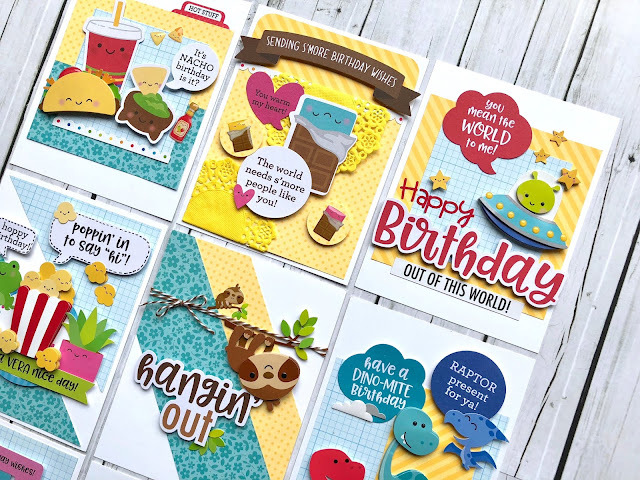 Hope this gives you some ideas for your next card making playtime! These are so much fun!!!! Thanks so much for sharing!!! What a fun idea!!!! Love it!! !